Vita Vea had his best game of the season against San Francisco this week. Vea was most noticeable in the run game – he made two really nice stops in the backfield on a pair of outside zone runs – and he also beat Joe Staley on a stunt to pick up a sack in the fourth quarter. Carl Nassib had himself a game on the edge. The former Cleveland Brown recorded a strip sack and a pair of hits, and on top of those, there were a handful of plays where he beat the guy blocking him but the throw got out just before he was able to get pressure. While not consistently accurate, Jameis Winston played well today, especially under pressure. He made a number of excellent decisions and throws while on the move, and his only turnover-worthy throw of the day was at least partially the fault of his receiver for getting beat on his route. Leonard Webster was forced into the lineup in the first half when starting right tackle Demar Dotson went down with an injury and had significant struggles throughout the game. He surrendered a number of pressures on the edge, too often forcing Winston into scramble mode. Nick Mullens played well in his first two starts, but the wheels fell off in game number three. Mullens was inaccurate for much of the game, especially early on, and he really struggled to hit his target when he was under pressure. He also struggled to get anything going downfield. He connected on a few passes in the intermediate range, but the deep game was virtually non-existent. Matt Breida was one of the few bright spots for the 49ers’ offense down in Tampa Bay. Breida got things going right from the start, rattling off a 33-yard run on the game’s first play from scrimmage, and he had some success moving the ball all afternoon. Breida forced a few missed tackles on the ground, earned close to half his yards after contact and picked up six first downs on the ground. The defensive line kept the 49ers in the game throughout the first half but seemed to tire after the break. The Bucs struggled to control the line of scrimmage early but got consistent movement late later in the game, allowing them to kill the clock effectively with a strong running game. This was not Richard Sherman‘s best game. Tampa Bay was not afraid to attack him in coverage. Mike Evans beat him deep for a big gain to set up Tampa Bay’s first score, and Sherman also surrendered a number of other receptions in front of him during the middle portion of the game. Winston took care of the ball and made a number of strong intermediate throws while scrambling to keep the Bucs’ offense on the field. 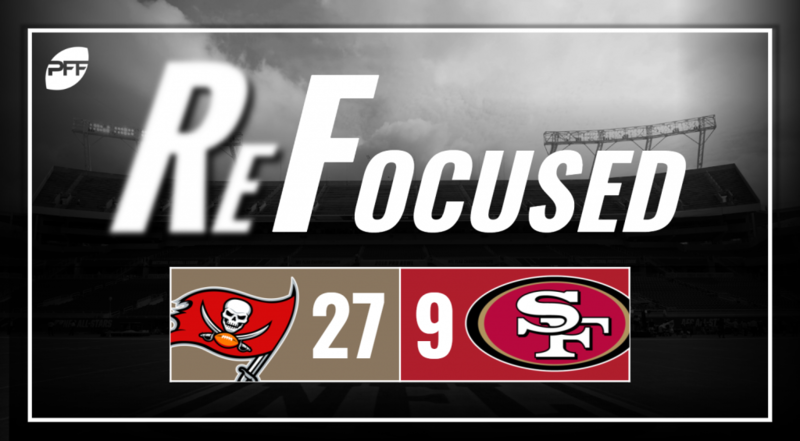 Mullens struggled with his accuracy, and San Francisco wasn’t able to sustain drives early on, putting themselves in a hole that was ultimately too deep to dig out of.